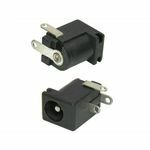 DC power connectors or "DC plugs and jacks" are a standardized type of connector that is not interchangeable. 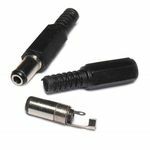 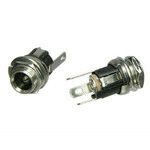 This type of connector was developed to prevent incompatible power sources from being used and damaging or destroying sensitive electronic equipment. 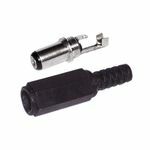 The cylindrical type of connectors are generally called "coaxial connectors" or "barrel connectors". 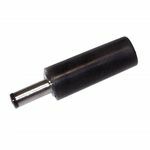 When describing the size of a dc power connector it is common to specify the outside diameter (O.D), the inside diameter (I.D) and the length of the barrel of the metal plug. 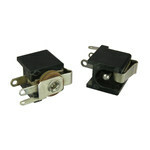 The voltage specified is generally less than 48V but typically 12V and the current is less than 5 Amps, typically around 2 Amps. 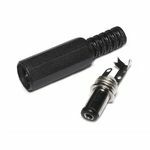 2.0mmX5.5mm In-Line DC Coax Plug w/Plastic Handle Solder Type Shell fits 9/64" wire Tip Length: 3/8" OA Length: 1-5/8"
2.1mm X 5.5mm DC Power Plug Shaft Length: 9.5mm Black handle fits 3/16" diameter wire. 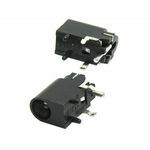 Solder and crimp connectors.